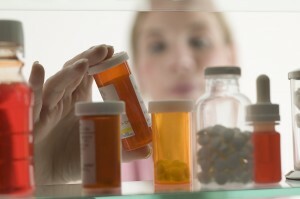 It can pay to pick a new Medicare Part D drug plan. Here’s how to start shopping. Medicare Part D prescription drug plans are, for those without serious health and hospitalization needs, the most important feature of their Medicare coverage. People with basic Medicare – Parts A and B – can purchase a stand-alone Part D plan, which usually goes by the shorthand “PDP.” People with Medicare Advantage (MA) plans usually get a Part D plan bundled into their MA plan; these are known as MA-PD plans. During Medicare’s annual open enrollment period, which runs from Oct. 15 through Dec. 7, existing Medicare enrollees are free to switch to new Part D plans, and cannot be refused or asked to pay more money for their coverage because of their age or any pre-existing health conditions. Premiums will be nearly 10 percent higher than in 2017, but this average masks large swings among individual plans. There are widespread differences among Part D plans, according to researchers at the Kaiser Family Foundation (KFF), which has studied 2018 Part D plans. Premiums will be nearly 10 percent higher than in 2017, but this average masks large swings among individual plans. Plans also vary in which drugs they cover and in how they charge for those drugs, according to Tricia Neuman, director of KFF’s Medicare work. In addition to citing KFF’s research, Neuman also bases that conclusion on plan comparisons she has done on behalf of a close family member. The estimated annual costs for the stand-alone Part D plans Neuman studied ranged from about $3,000 to $13,000, she said, noting that the family member was prescribed eight drugs, all but one of which were generics. Despite this heavy reliance on generic medications, she found that some plans did not cover all of the drugs or placed them in more expensive pricing tiers. 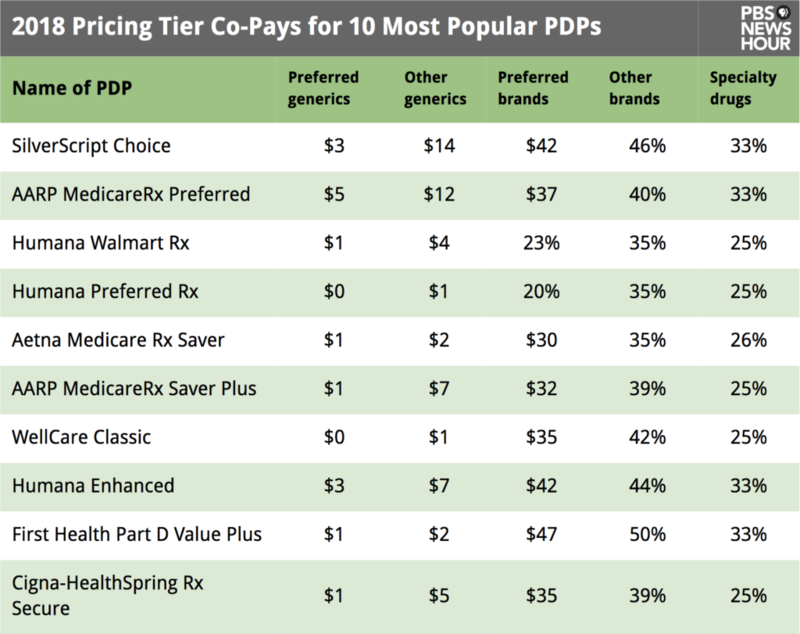 Most Part D plans use five pricing tiers – preferred generics, other generics, preferred branded drugs, other branded drugs, and expensive specialty medications. Here are two helpful tables from Kaiser. 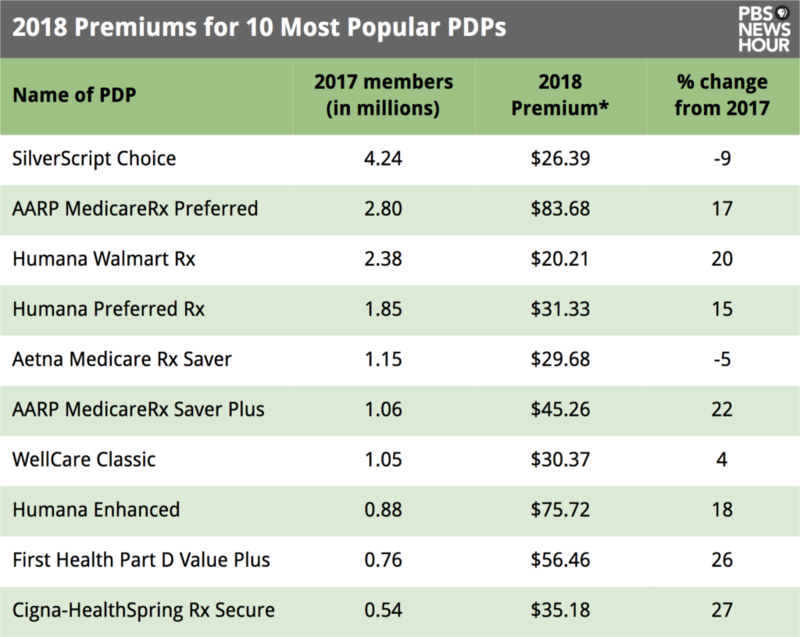 The first shows 2018 average premiums for the 10 most popular PDPs this year. Actual premiums will vary by geographic location. Kaiser used 2017 local-area enrollments to calculate a weighted average for each plan. All Part D plans may charge an annual deductible next year of up to $405 (versus $400 this year). After the plan deductible has been reached, the plans will cover drugs up until total costs paid by the enrollee and the plan have reached $3,750 (up from $3,700 in 2017). At that point, enrollees will enter what’s known as the coverage gap, or donut hole. In this gap, drug manufacturers will discount the price of branded drugs by 50 percent, enrollees will pay 35 percent and the plans will pay 15 percent. For generics, plans will pay 56 percent and enrollees 44 percent. People will stay in the coverage gap until their 2018 out-of-pocket drug spending reaches $5,000 (up from $4,950 this year). This does not include what their insurer has paid but it does include the 50-percent discount on branded drugs. Even if you like your current Part D plan, you still should spend some time during open enrollment comparing it with other plans. They then will enter what’s called the catastrophic phase of their plan, where they will pay no more than 5 percent of the cost of their drugs. Kaiser estimates total drug spending will have reached $8,418 in 2018 by the time a person enters the catastrophic phase, compared with $8,071 this year. By now, you may be forgiven if your eyes long ago glazed over after being exposed to all this drug data! However, these details are important, and, as you’ve seen, can result in enormous spending differences among plans. So, even if you like your current Part D plan, you still should spend some time during open enrollment to comparing it with other plans sold where you live. Rick and Karen – Colo.: We don’t understand how Social Security’s Family Maximum Benefit (FMB) works. Can you help out? Rick just turned 62 on June 18, and elected to take Social Security early, primarily because we have a 14-year-old and a 15-year-old at home. He is receiving $1,468 a month and each of our children is getting $771, for a total of $3,010. Our full FMB is $3,510 and we thought we’d get that much, but a Social Security representative said our benefits are being reduced because Rick filed early. Karen has also filed for benefits, and we wondered if they would trigger the program’s Combined Family Maximum Benefit and, if so, how? 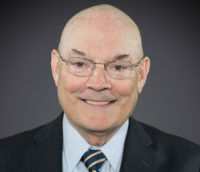 Phil Moeller: Social Security is correct that your early filing for your retirement benefits reduced your benefits. However, this would not have an impact on what your family members would receive unless Karen also filed for a spousal benefit based on Rick’s earnings record. The FMB is based on an individual’s earnings record. Unfortunately, Rick’s own benefit will not increase. By filing at age 62, he agreed to accept a $1,468 monthly benefit. It is not reduced at all by the FMB, and will not increase. Even after your kids leave high school and are no longer eligible for benefits, Rick’s own retirement benefit would not be adjusted upward. This is a trade-off that people make in order for their children to be eligible to file for a benefit. Overall, of course, your kids are receiving $1,442 a month for several years that they otherwise would not receive. Related Does Medicare make sense for seniors with employer health coverage? If you did not need your benefit when your kids exhausted their eligibility, you could suspend it. You would receive no benefit while it’s suspended, but your benefit would increase at the rate of 8 percent a year until you reached your full retirement age and resumed taking it. The FMB is not a number of dollars you would ever be guaranteed to receive, but a ceiling on the maximum benefits your family is entitled to receive, based only on one person’s earnings record. Because Rick filed early, as you noted, the benefits received by Rick and your children will not reach that ceiling. It is not clear to me whether your children’s benefits are being reduced because the agency is claiming that your FMB ceiling has been reduced by your early filing. I would clarify this with the agency. If this is the case, then your wife’s filing would trigger the combined FMB and might increase your children’s benefits. Or, you might come out ahead by switching one child from claiming both children on Rick’s record to claiming a child on each of your records. I know this stuff is complicated. As always, I advise people to review these matters with Social Security before they make any benefit filing decisions. Anonymous: I turned 65 last year. I am still covered by my husband’s health plan, and was told by the employer and Medicare that I did not need to sign up for Part B at that time. We’ve just learned that we will be losing our workplace insurance soon. But Medicare now tells me that I cannot sign up for Part B until next year, and that it won’t become effective until July! Why didn’t they tell me that last year? I was so confused and called them for help, and now I am beyond upset. Is there anything I can do? Please help! Judy: I receive Social Security survivor benefits and I live abroad. I received a letter from Social Security advising me that I will be eligible for Medicare starting next month. The letter says that beginning next month, they will deduct $134 from my monthly Social Security check for the Medicare premiums. Am I required to pay this premium? I can’t use Medicare abroad anyway. The letter I received gives me no option to withdraw. It only says they will start deducting the premiums starting next month. Phil Moeller: You are under no obligation to sign up for Part B of Medicare. Should you later return to the U.S., and want Medicare, you would face lifetime late-enrollment penalties. However, odds are they would be less than paying premiums for insurance you can’t use. You need to reject Part B. If you have received a Medicare card from Social Security, cross out Part B and write “Rejected” on the card, and return it to Social Security. I’d also call the agency to do this. Lastly, here’s an FAQ from the agency on how to terminate Part B.
Loretta: My husband is 68 and still working fulltime and we are covered by employer health insurance. We have a $4,800 deductible, and 80-percent coverage after that deductible, with an $8,000 ceiling on our out-of-pocket expenses. He just had ankle surgery and we are going to be out of pocket a minimum of $5,000 so far. My question is, if we were both enrolled in Medicare, could we get cheaper and better coverage? Phil Moeller: That’s a great question but not one that can be easily answered. Here’s a recent piece I wrote about some of the trade-offs between keeping employer insurance or getting Medicare. If you dropped your employer plan and got Medicare instead, you would have two sets of choices. You could get basic Medicare (Parts A and B) and a stand-alone Part D drug plan. I’d also recommend a Medigap plan, which covers some major expenses that basic Medicare does not fully pay for. Part A charges no premiums for people who qualify for Social Security. The monthly Part B premium is now $134 a month but can be much higher for people with high incomes. Part D premiums range from $30 to $70 or so a month, and have their own set of annual deductibles and out-of-pocket limits. Medigap plans can run from less than $100 to as much as $200 a month, depending on where you live and the type of plan you get. You would need to double these premiums for both of you, as Medicare covers only individuals, not families. You could get a Medicare Advantage plan, which covers everything that basic Medicare covers, often includes some things that basic Medicare does not cover (like vision, hearing, and dental, plus health clubs), and usually includes a Part D plan. These plans also provide out-of-pocket ceilings, and thus avoid the need for a Medigap plan. You would still pay the Part B premium, but the total charges for MA plans often are far less than for basic Medicare. There are two big potential downsides of Medicare Advantage: A) Your coverage may be limited to care near where you live; B) you may be restricted to using only doctors and hospitals in the plan’s provider network. Editor’s Note: Journalist Philip Moeller is here to provide the answers you need on aging and retirement. His weekly column, “Ask Phil,” aims to help older Americans and their families by answering their health care and financial questions. Send your questions to Phil.